The 12th IT&CM China makes a stellar open marked by a stronger foothold within the Chinese MICE market backed by the support of local endorsing associations, destinations, and brands. Organisers revealed indicators that include exhibitors returning with 50% to 100% larger booths, more domestic sellers represented through independent pavilions, an ideal 80:20 Chinese to international buyer participation, 30 influential local experts helming knowledge sessions, the largest showing of Chinese media participation. 38 Chinese media have registered to attend, joining 12 hosted international media organisations. The China Business Event Federation’s officiated their foundation during this evening’s Opening Ceremony at Hilton Shanghai Hongqiao. This was preceded by today’s keynote address at the opening session held at the Marriott Courtyard where China’s globally expanding MICE footprint was presented. The opening session featured illustrious industry leaders Jack Yao, Secretary General of the China Council for the Promotion of International Trade (CCPIT); Alicia Yao, Vice President of the China Business Event Federation (CBEF); Cathy Yun, Founder of Sourcing China; Roger Wang, President of the Global Chinese Marketing Federation; and Zhang Shijing, President of CTS MICE, are among the highlights that demonstrate IT&CM China’s prominence as a leading industry event. “China’s MICE industry is onto its next wave of growth, one that is dependent on our collective ability to propel our standards and competitive advantage to the next level. To do this, we are spearheading the launch of guidelines for national conventions and MICE associations to raise the industry’s sophistication nationwide to compete globally. Along with like-minded association counterparts, we are excited to leverage on IT&CM China to reach out to our fellow peers at large,” said Alicia Yao, Vice President of the China Business Event Federation (CBEF). “This year’s show sees a significant growth in the number of association buyers and corporate buyers, made possible by the co-location of Corporate Travel World (CTW) China and our various association partnerships. Our consistent track record has been vital in securing the returning engagement of exhibitors, and the increase you see from some of them” said Li Zhuyuan, Deputy General Manager of co-organiser CITS International M.I.C.E. Co., Ltd.
Co-located CTW China 2018 saw 234 corporate buyers and top-level industry experts come together at the Meet-Your-Peers session, one of the Event’s most successful engagement sessions in attracting local corporate buyers to the show. 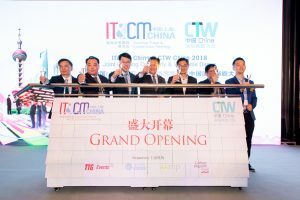 IT&CM China 2018 will connect 289 global and domestic destinations and brands to over 500 Chinese and international buyers over some 14,000 business appointments. IT&CM China 2018 will be held from 20 – 22 March in Shanghai. To explore how you can make the most out of the exhibition, sponsorship, and networking opportunities at IT&CM China, contact us at itcmchina@ttgasia.com.